I was sitting outside Starbucks with the dogs, having a breakfast sandwich and an Americano. 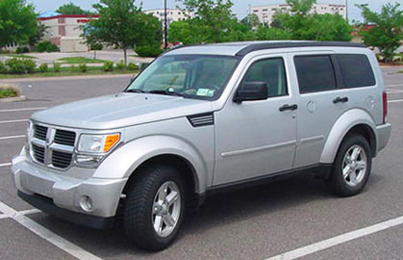 This car pulls in and out steps a woman who looks back at her car and says, "I took up two spaces." (pause) "I'd better hurry!" Normally, this time of the morning, the lot is full. 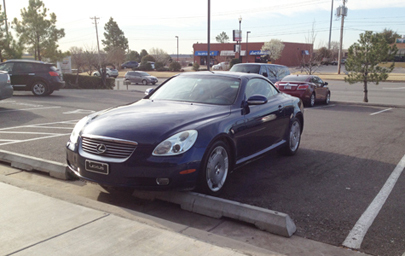 Fortunately, the extra space wasn't needed while she was inside. 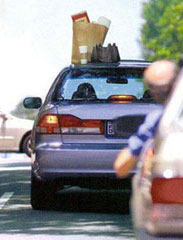 Maybe she just needed extra room to get back into her car. 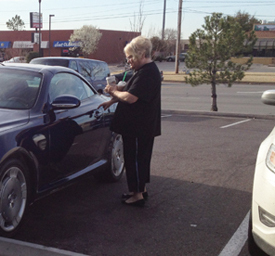 Her hands were full of drinks - she needed a place to set something down so she could get to her keys. 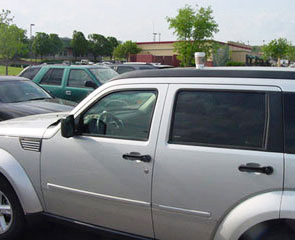 You may have done this - set your drink on top of your car while you got your keys out. 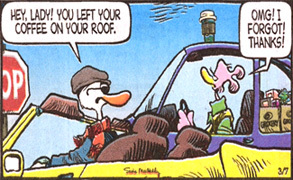 You then got in the car, started it up and drove off. Oops, there goes the drink. Shoot. Not uncommon - many of us have done it. 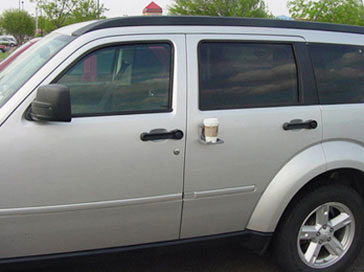 There are cup holders all over the interior of cars - we love the convenience of being able to set our drink down. But we need one outside the car. To hold our stuff while we move to the inside of the car. I searched online and bought a fold-up cup holder to use and test on my car. The trial run worked great. So much easier. 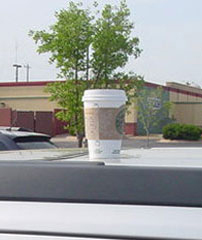 I may still forget the cup and drive off, but I'm less likely to do that since the cup is more obvious as I get into the car. 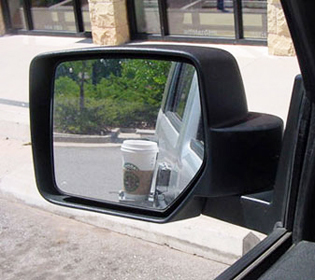 You can even see the cup in the side mirror, in case you forgot to get it before you got in the car. 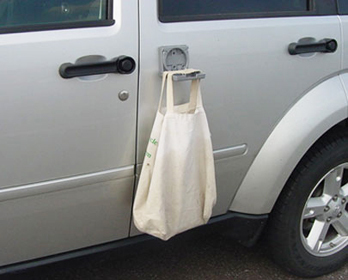 The ledge can also hold a shopping bag or briefcase. 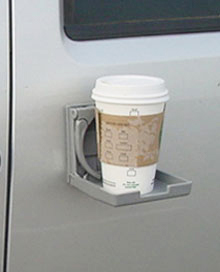 The exterior cup holder can be constructed with the same door as the gas tank filler flap. 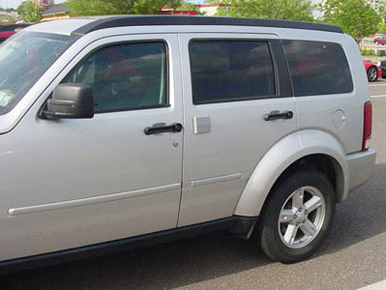 The depth is so minimal that it shouldn't interfere with the operation of the window; the flush body style when closed will not provide any aerodynamic drag. 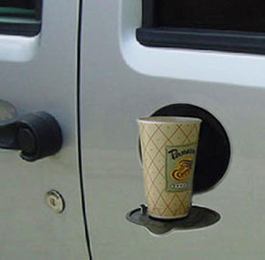 I had explained the car cupholder to numerous friends, strangers, mechanics, and car wash attendants. Most were curious and impressed. Years later, my brother commented that he needed something similar by the entry door to his house - to help him get out his house keys when his hands are full. 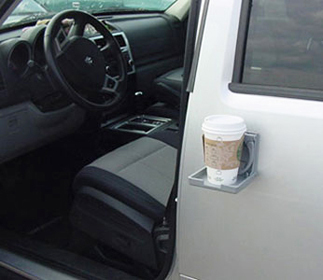 What a great idea - to adapt the car cupholder to the house. 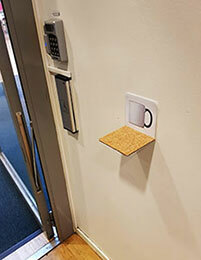 For the same reasons - to make it more convenient to get house keys out or to open the door. 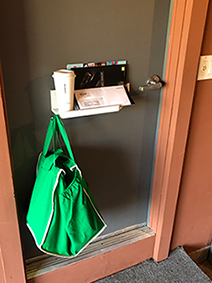 Instead of just a cupholder, I explored a shelf that could hold more stuff that I carry from the car to the house - mail and shopping bags. I needed it by the door from the groj to the house. I thought it could be a fold-down shelf so it wouldn't be in the way, next to the door. 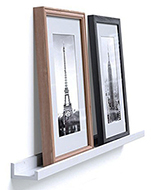 But, that presented some issues - how could I pull the shelf down with my hands full? 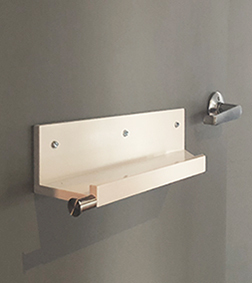 I opted for a shallow shelf that mounted on the recessed door. That would not protrude inconveniently into the groj. Rehearsing the motion, I also realized that mounting it on the door would make it easier to retrieve the items since the door opened into the house, swinging the items in with me as I entered. • Room to hold grocery and fast food bags, cups, mail, magazines. 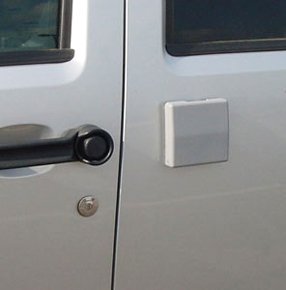 • Easily accessible from both the exterior and the interior, once the door is opened. • Minimal intrusion into the space. • Match and respect the wall and door style and decor. I bought a picture ledge at Lowe's, cut it to size, painted it white, and mounted a knob on which to hang shopping bags. 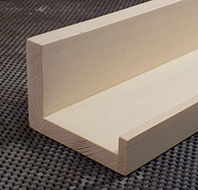 The right side of the shelf/ledge was cut at a 45* angle to respect the angles in the house and to make more room around the door handle. In the groj, the ledge is by the car door - convenient to place things on the shelf. 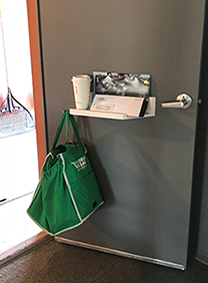 When the door swings open into the living room, the ledge delivers the items inside, making it easy to get them. 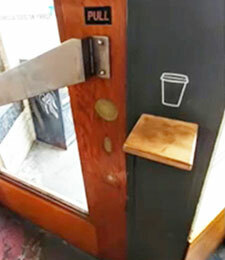 Update: In 2019, these photos were posted online of cupholders next to doors so one could set cup down to lock door or push alarm buttons or any other task.